Seventeen-year-old Linsey Hart disappears the day before she’s due to leave for college. As her neighbors piece together what they saw and what they think they know about the missing girl, their long-held secrets, prejudices, and entanglements become rudely evident. There’s Linsey’s mother, Abigail, whose door-to-door searching makes her social outcast status painfully obvious; stay-at-home mom Reeva, whose primary concern is covering up the affair she’s been having with the Starbucks barista; Mr. Leonard, a reclusive retired piano teacher—and the last person to see Linsey alive; George, an eleven year-old gifted loner who is determined to find out what happened to Linsey; and Timmy, Linsey’s ex-boyfriend, who is left grieving as he embarks on his own college career. A keenly observed portrait of a small town under duress, When She Was Gone is a searing portrayal of the bonds that hold a community together—and the secrets and lies that threaten to rip it apart. What does a novel have to accomplish in order to keep my attention? 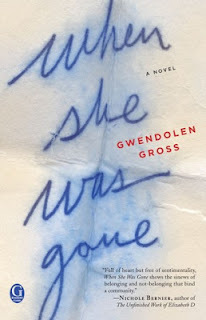 Apparently, do exactly what Gwendolyn Gross did in her novel, When She Was Gone, because I was riveted from beginning to end. Linsey Hart is being watched. By her mother, by her boyfriend and by a strange neighbor who keeps a keen eye on everyone in Linsey’s neighborhood from the safety of his piano dress, where he plays for hours, wearing his late mother’s dresses. So when Linsey slips into the night, leaving a note tucked into the door and disappears, questions start arising through the cracks of the fences that separate the neighbors’ yards. What Linsey doesn’t plan on is that her note gets carried away in the wind where her parents will never find it. If they had read the note right away, her mother wouldn’t be sick with worry and dealing with the loss of another child. Or the boy next door wouldn’t be overcome with curiosity and a yearning to help. Linsey’s disappearance sets the neighborhood into an interesting tailspin. Everyone is watching, waiting and wondering. When She Was Gone is about Linsey’s disappearance, but for me, that wasn’t the most important part of the story. What was, however, were the other characters. Gross has done a phenomenal job creating these complex and passionate people. I wanted to meet them, hug them, tell them to relax. I almost forgot I was supposed to be worried about where Linsey was because I was so involved with the individual storylines of her neighbors. If you are looking for a mystery thriller, this isn’t what I would recommend, as Linsey’s situation isn’t as complex as most missing children cases are. I would recommend this book to someone who loves strong character development and more than one element and point of view in a story. Thank you to Gallery Books for our revew copy. All opinions are our own.